Little Falls, NY-Michael "Mike" Francis Liddon, USMC, age 52, of Grant Pass, Oregon (a Little Falls, NY native), who fought a longtime battle with Multiple sclerosis (MS), passed away peacefully and courageously on Friday morning, August 17, 2018, following a brief bout with cancer. His passing occurred in his home, where he was in the presence of his loved ones. Michael, son of Francis "Frank" and Patricia "Pat" (Green) Liddon, was born on November 4th, 1965 in Santa Ana, California. The family relocated to Little Falls, New York in 1969. 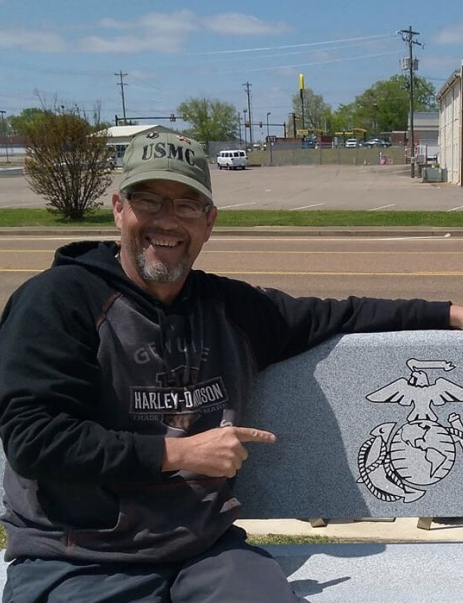 Mike graduated from Little Falls High School in 1983 and enlisted in the U.S Marine Corps. While in the Marines, Mike toured the WESTPAC of ’85 as an aircraft communication systems technician. He returned home to Little Falls where he became a lifelong resident. Mike received his Bachelor of Professional Studies at the State University of New York Institute of Technology at Utica-Marcy. He owned his own branch of American Express Financial and Tax Preparer business on Main St. Little Falls. Mike loved coaching the Little Falls football team, hunting and fishing, but most importantly spending time with his family and making everyone laugh. After building his home on Murphy Rd, he enjoyed spending time with his father next door and could not be found without his best pal Rosco by his side. Mike later moved to Oregon to be united with his grandson and to live the rest of his life traveling and enjoying every moment with his family and friends. Mike is survived by his siblings; Karen Wilson, of Little Falls, Timothy Liddon, of Little Falls, Margaret "Peggy" Hadcock, and husband, Dan, of Little Falls, Donna Marsh, and husband, Mark, of Ft. Plain, Matthew Liddon, and wife, Cheryl, of Little Falls, and Teresa Taylor, and husband, Chris, of Savannah, TN ; his children: Chad Liddon and wife, Jenn, Curtis Rockwell and wife, Victoria, Matthew Liddon, Courtney Liddon and boyfriend John; and grandson Malcom Francis Liddon, of Grant Pass,OR as well as many loved nieces and nephews. Mike is predeceased by his parents Francis and Patricia Liddon and his nephew Jeremiah Wilson. The family would like to thank Hospice and The United States Veterans Affairs for the long term care throughout Mike's battle with MS and end of life care. Mohawk Valley Funerals and Cremations (Daniel J.Enea, Owner), 7507 State Route 5 (corner of Bidleman Road) between Little Falls and St. Johnsville, 315-508-5131, has been entrusted with Mike’s funeral arrangements. The family will receive relatives and friends at Mohawk Valley Funerals and Cremations on Saturday, September 8, 2018 from 12- 4 p.m. The U.S Marine Corps will conclude visiting hours with military honors at the funeral home at 4 p.m. on Saturday. To add to his online tribute, please click above.